Below is a front and back view of the Netopia Wireless Gateway (versions 1 and 2). Be certain that the Ethernet cable, phone cable, and power cable are connected properly before continuing setup. DSL Light- Green when a DSL signal is detected. Flashing if no DSL service is found. Internet- Green if successfully connected to the Internet (may blink when passing traffic). Dark or red if no Internet connection is found. LAN- Flashing green when a computer is connected with an Ethernet cable and traffic is passing over the connection. The lights correspond to the numbers Ethernet jacks on the back of the modem. WLAN - Flashing green when the wireless network is active. Make sure the computer is plugged into the modem directly with an Ethernet cable. There are 4 ports on the back of the modem- any of the available ports may be used. Open a web browser, and enter 192.168.1.1 in the Address bar. Note-on Version 2 model, you will automatically go to this address if no Internet connection is found. You will now see the modem interface. Click on the Wizard Setup link on the left side of the screen. On the menu, choose I Have a PPPoE username and password, then click Next. Enter your complete TOAST.net email address and password as indicated. Click Next. The screen will report if the connection was successful. If so, click Done. If it wasn't successful, revise the username/password and repeat setup 6. If a networking or DSL line error is displayed, check the modem connections. The Internet light will light green when the connection is successful. Test the connection by browsing to a web page. Click Advanced Configurations on the left menu. Click Wireless Setup on the left menu. 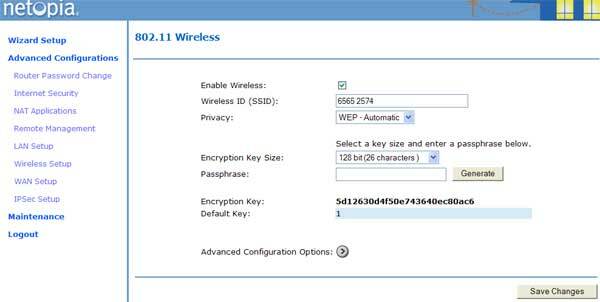 The pre-set WEP encryption key is shown on the right. This key is used to establish a wireless connection between the modem and a computer. Record this key in a safe place so it can be entered into your computer. Click here for assistance on setting up your computer to use a wireless connection. Next to Privacy, choose WPA - PSK. New options will appear on the screen (shown below). Next to Pre Shared Key: enter in a wireless key. The key must be a minimum of 8 characters. Numbers, letters, and symbols may be used. Click Save Changes when complete. 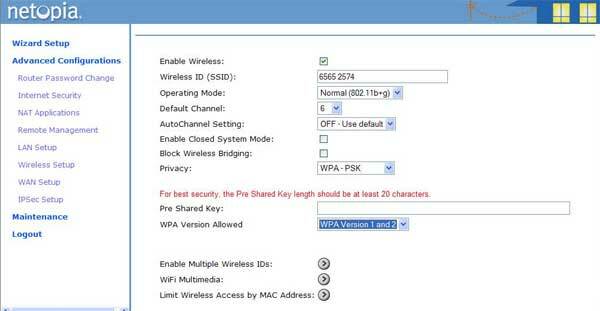 Enter the new WPA key into your computer's wireless settings.